We have been making this recipe for about a year now. It is a family favorite. No complaints ever. 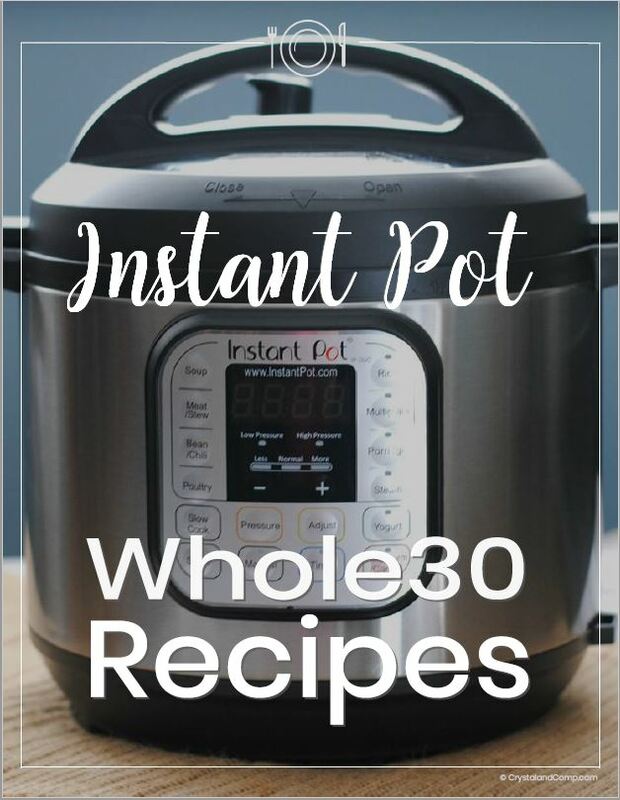 For our large family utilizing Instant Pot recipes is a huge time saver. 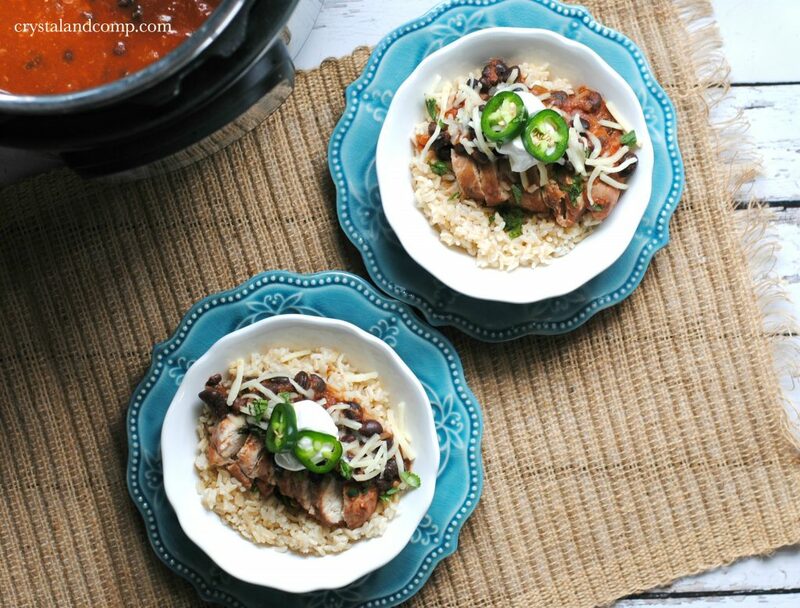 These Instant Pot Black Bean Chicken Bowls are perfect for a busy weeknight. This cooks super fast- just 10 minutes! With six kids (one is a teen) and two adults someone always has something to say. It never fails, there is that one child that picks something out of their plate at dinner. This is so simple and packed with protein, you just can’t go wrong. And everyone can customize their bowl the way they like it. This is such a simple meal. First we’re going to get the chicken going in the pressure cooker. Place chicken breast into Instant Pot and pour salsa and black beans over the top. This is the Instant Pot I use and love. It is 6 quarts and perfectly sized for my family. Lock lid into place and set vent to sealing. Set Instant Pot to manual high pressure(or poultry if you have that setting) for 10 minutes. When Instant Pot beeps, let natural release for 10 minutes before quick releasing remaining pressure. While chicken is naturally releasing, make rice according to box directions. For time saving you can use instant brown rice, but honestly I love making brown rice in the Instant Pot. It cooks in 22 minutes. I like to make up an bunch and freeze it. Then all I have to do is reheat as needed. Remove chicken breast and slice at an angle. Make a bed of rice in a bowl and lay chicken breast on top. Spoon black bean salsa over the top of the chicken and rice. Add your favorite toppings and serve. Eating Drive Thru Far Too Often? 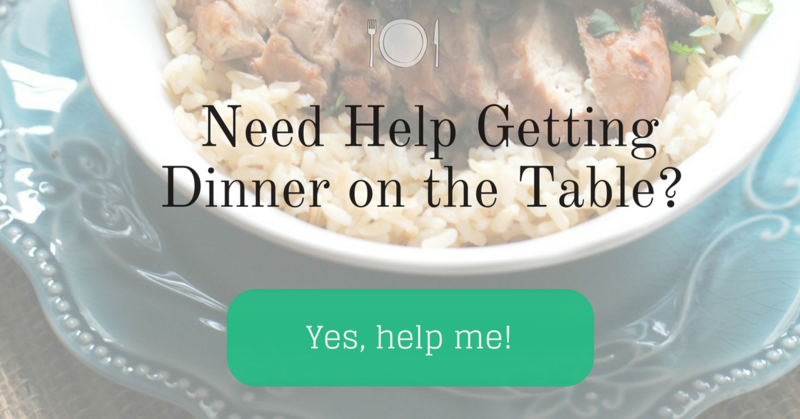 We can help you get dinner on the the table! Check out our done-for-you freezer meal plans! 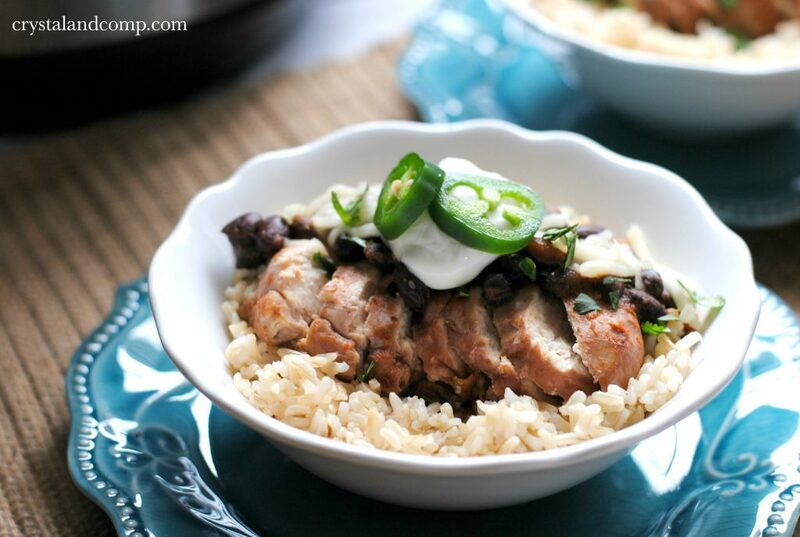 This instant pot black bean chicken is a simple and flavorful meal! 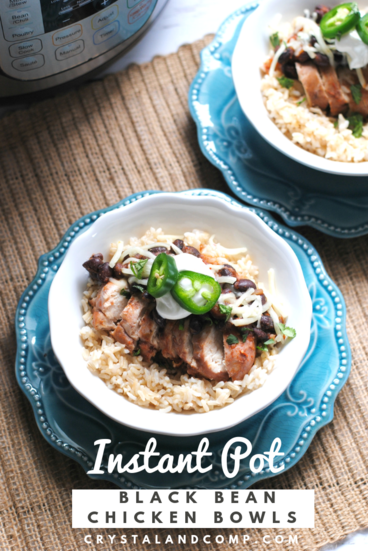 Place chicken breast into Instant Pot and pour salsa and black beans over the top. Lock lid into place and set vent to sealing.Set Instant Pot to manual high pressure(or poultry if you have that setting) for 10 minutes.When Instant Pot beeps, let natural release for 10 minutes before quick releasing remaining pressure.While chicken is naturally releasing, make rice according to box directions.Remove chicken breast and slice at an angle.Make a bed of rice in a bowl and lay chicken breast on top.Spoon black bean salsa over the top of the chicken and rice. Add your favorite toppings and serve. Yum! This looks delicious and I love those blue plates! I switched out our normal chicken dish for the middle of the week last week for this recipe. The kids loved it so did myself and my husband. It’s a week later and as I left the kids at school I was told that we had to have this again. 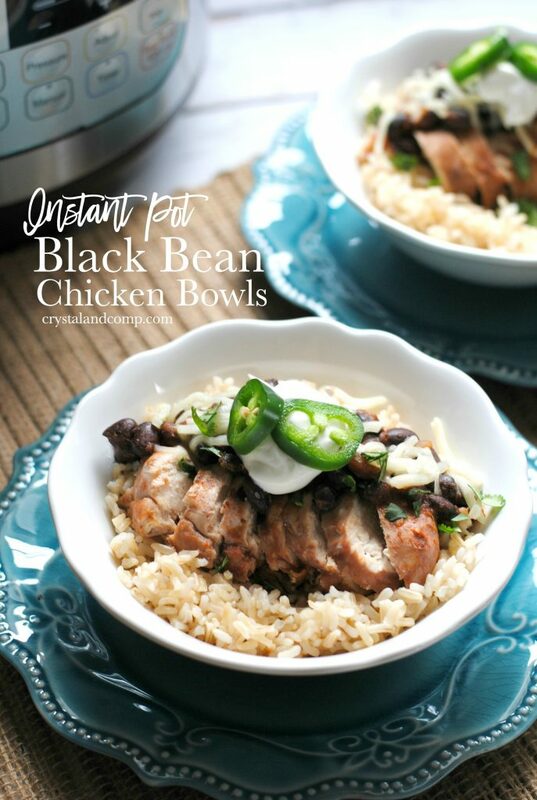 Oh my, this instant pot black bean chicken bowl recipe sounds sooo good. Thank you for sharing at To Grandma’s House we Go. Thanks for sharing at the To Grandma’s House We Go DIY, Crafts, Recipes and More link party. I pinned this. Hope to see you again next week. I love the flavor combination of your delicious Black Bean and Chicken Bowl. Thanks so much for sharing with us at Full Plate Thursday, your post is awesome. Hope you are having a great week and come back to see us soon!